Sea Ray’s 380 Aft Cabin rides on a wide, deep-V hull designed for stability and wave-flattening performance. With two staterooms, a convertible salon sofa, and generous bridge seating, she comfortably accommodates a crew of six above and below decks. A large, enclosed, hardtop aft deck with refreshment centre has wing-door access to side walkways, and molded-steps lead to the bridge and extended swim platform. The main salon is spacious and inviting with rich wood finishes and accents that extend to the master and guest staterooms. On the bridge, the impressive flush-mount electronics array includes a recent Raymarine chart plotter, radar, autopilot and much more. She has an all-chain windlass and a power-assisted Dinghy Caddy lift system guaranteed to make overnight anchorages a breeze. Cabin décor is in warm, neutral tones complimenting the upgraded Vitricor clear maple interior wood package. This Great Lakes, freshwater 380 Aft Cabin has logged approximately 790 hours since new, and only 105 hours since undergoing a rebuild of both the main 7.4L 380HP engines (including new fuel injectors and plugs), rebuild of the starboard transmission, installation of a new generator long-block and installation of two new propellers, all in 2013. These major power plant investments effectively reset the clock and will improve this boat's resale value for many years to come compared to similar boats on the market with higher hours. 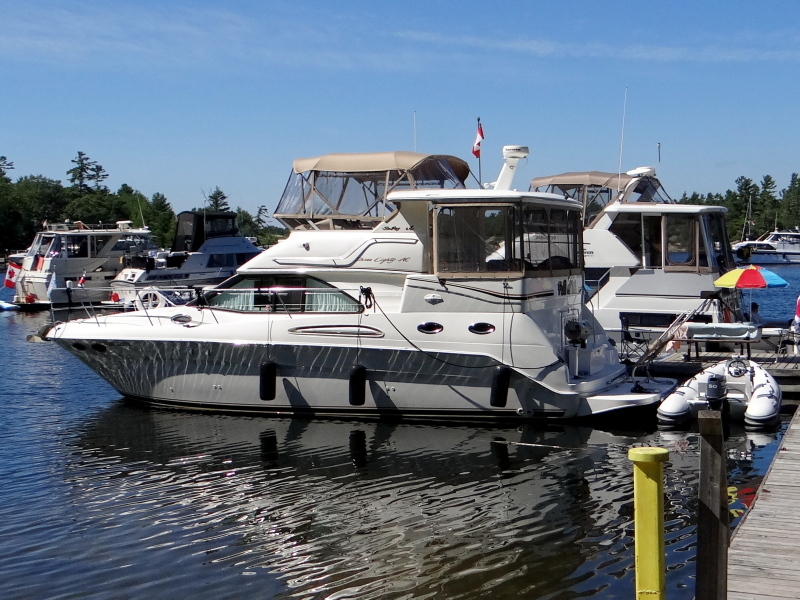 This Sea Ray 380 Aft Cabin is in beautiful condition and is a pleasure to show. Located off-site … call ahead for appointment.